1.Big Capacity Battery Included-Super long battery life, one CR2450 battery lasts for 200+ hours, save your money on batteries. 2.24 Hours in Cycle Timer- 6 hours on and 18 hours off in cycle,no need to turn the light on and off every day,save too much trouble. 3.Flickering and Real -Look like and flicker like real candles, high quality materials, primitive burning candle design, premium IC and bright LEDs. 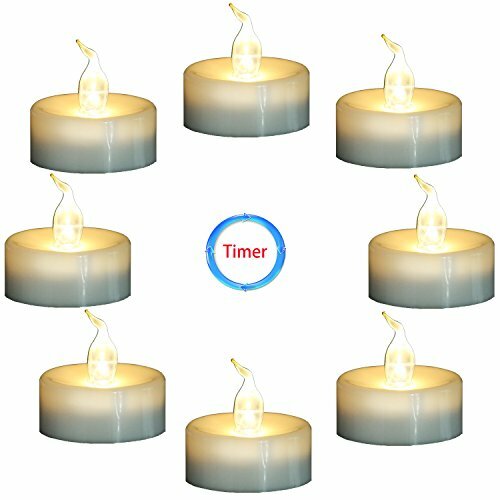 4.Ideal for Decorations -Battery-powered (battery included & installed) warm white color LED tea light candles provide realistic flickering effect, ideal for accent decorations for holiday celebrations, wedding ceremonies, special occasions such as birthdays and anniversaries, memorial services, church gatherings, DIY projects and etc. Wind-proof for both indoors and outdoors use, at homes, restaurants, churches, schools, backyards, sports venues and etc. 5.Satisfactory guarantee-Topstone stands behind all of its products 100%. These lights come with a 12 month warranty. If you received broken or defective lights, please contact us any time, we will compensate you with free replacement or full refund. I have these all over the house. Flameless flickering candles with timer.